Hi! Glad you stopped by for a visit today to read the second half of this article. The tutorial for making your own Inukshuk along with some photos of a few of mine follows the article. Inukshuks (Inuksuits plural) in themselves are the product of cooperation. The hands and effort of an entire group are required to build these massive stone sculptures. They are the result of a consensus of purpose and focused action by a group united in its goal and labour. The sculpture reminds us that as good as our individual efforts may be, together we can do even greater things. Each individual stone in an inukshuk supports and is supported by the one above and the one below it. No one piece is any more or any less important than another. Its strength lies in its unity. Its significance comes from its meaning as a whole. Each individual by themselves is significant. As part of a team, each of us supports and is supported by one another. We are united by a common goal and together we are part of a greater whole. The stones which make up the Inukshuk are secured through balance. No concrete to glue them together here! The stones are chosen for how well they fit together. 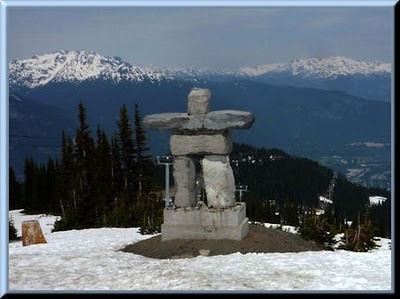 Look at the structure below that is on top of Whistler Mountain (the site for the majority of the Olympic skiing events) and see how the removal of even one stone would destroy the integrity of the whole. So too, with a team. Each individual in a team is necessary for the realization of the team's purpose. The removal of even one person will result in the weakening of the structure. What holds the team together is balance - the complementary nature of individual skills. 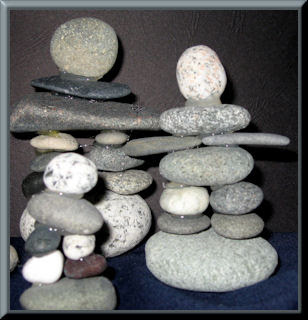 Inukshuks are also the symbol of the human spirit. They recognize our ability to succeed with others, where alone we would fail. They remind of of our need to belong to something greater than ourselves. They prompt us to reconnect with our individual responsibility to invest our efforts today so we may all have a better tomorrow. They ask us to heed the knowledge of our inner knowingness, hear the voice of our intuition and move to the harmonious music in our heart and spirit. 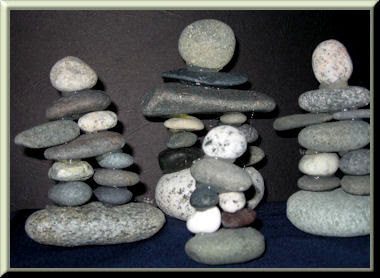 Inukshuks convey the importance of personal contribution and reinforce our ability to commit to common goals. They implore us to share the fruits of our learning, our wisdom with one another. The Inukshuk is a reminder for all of us that our efforts towards the common good of our "earth" community are appreciated. It is an enduring symbol that invites us to speak with one another on a higher level, from our hearts and spirit, about what really matters in life. Creating your own Inukshuk is fairly simple. Decide on how big you want your Inukshuk to be. 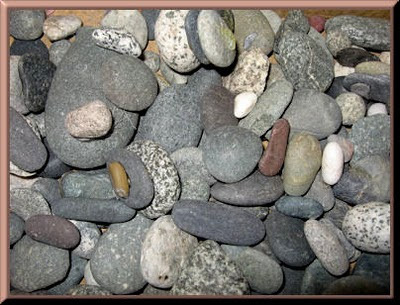 On your next beach or lake stroll, look for rocks that "speak to you". Preferably they should all be about the same size for the body and smaller ones for the legs and arms. The most special rock you find should be designated for the head. I like to place my little "guys" on a larger rock so that they sit firmly wherever I place them (in bookshelves, on the windowsill, outdoor tables, tree stumps, in the hidden recesses of the rock face in my side garden and of course in the garden itself) I love it when people who visit us in the summer discover them in the oddest of places. The large Inukshuks in this photo have two arms signifying either a valley ahead or safe passageway. But notice the small Inukshuk in front... it has no arms! This signifies that where this Inukshuk stands there is a cache of food. Notice the Inukshuk on the left. It has only one arm. This signifies that you should continue your journey in the direction the arm is pointing. Now, depending on where you live in the country, the trick may be finding stones that are flat enough to sit on top of each other. The arms look best when made out of long, narrow rocks if you can find some. If not, glue some smaller stones together in a row. But how do you balance all of them? If you have been lucky enough to find rocks that balance easily, you have been fortunate. But don't despair if you haven't! Just pull out your handy dandy hot glue gun to glue your stones together. Some of the small Inukshuks I have were glued together with the hot glue gun and they have actually held up quite well nestled among the flowers in the garden (I swear they make the flowers bloom brighter and better!). However, they don't like the hot sun beating down on them in the summer. They will fall apart as the sun melts the hot glue if they are left too exposed to the elements. That's all there is to it when you are using real rocks. Happy gathering! Thanks for that information. I had seen that Olympic rocks on TV and wondered about it. I've also seen stacks of rocks that people have left in various places, mostly near rivers and the beach. Now I understand them and I've have learned a new word! This is fantastic. I had no idea the Olympic logo was rooted in local culture and history. I too have been glued to the TV watching the Olympics and cheering on the Canadians and the British (we British haven't been doing too well - though at least we have one medal). It has been wonderful to see Canada do so well on home soil. Good luck for the ice hockey tonight. 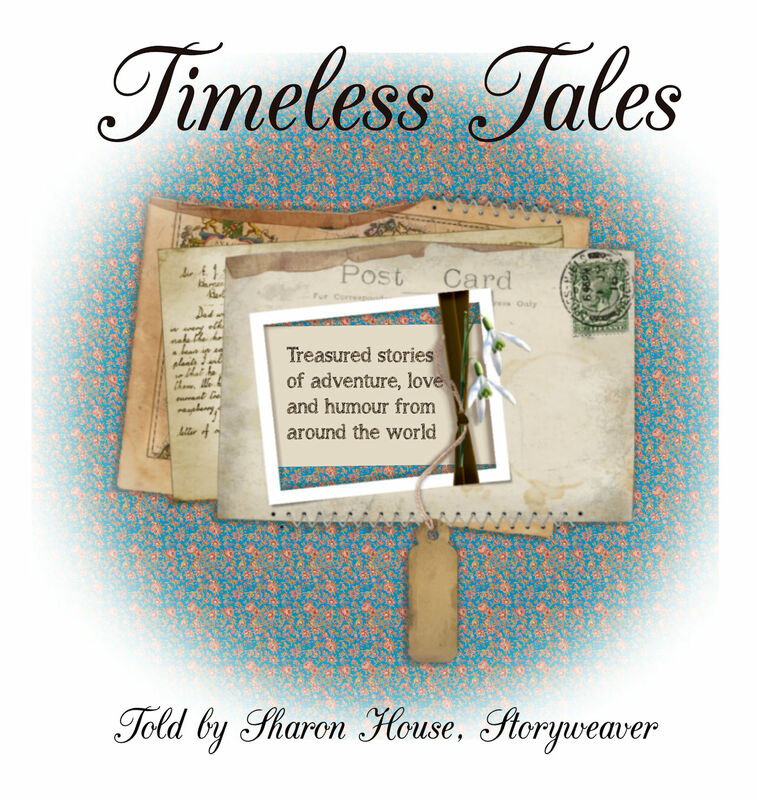 I found you thru FOCD...glad i did...this is very interesting...felt i had been to church reading your post...thank you! my bad, i found you thru art techniques!!! If you live somewhere hot like I do use liguid nails(clear)-it should work but haven't tried a Inukshuk but it worked on a corner of the pool that was falling in for at least 5 years now.Thanks for the story I am going to pass it on plus make some.